Art on the Palouse: Uniontown’s Artisans at the Dahmen Barn | Oh, the Places We See . . .
Frank Wolfe built the barn in the 1930s for Jack Dahmen to be used as a commercial dairy, but Jack sold it in 1952 to his nephew Steve Dahmen and wife Junette. It was Steve who began the construction of the now-famous wheel fence. 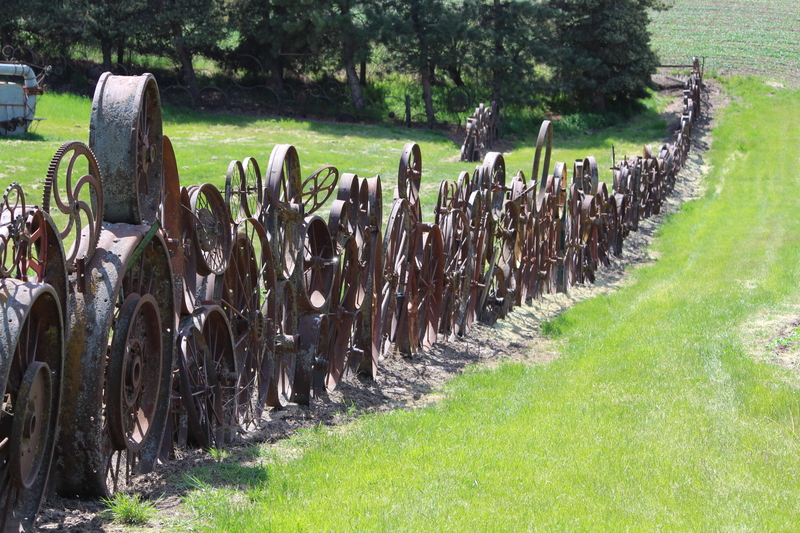 Over 1000 rusting, quirky wheels and spokes form the fence that has become a haven for photographers. You can see photos of this folksy, farm artistry in numerous publications such as National Geographic. Because both Steve and Junette were artisans in their own right, they donated the barn to the community in 2004 to be used as artists’ studios. Throughout the long process of restoration, the barn was cleaned, gutted, stabilized, and then outfitted with new flooring and interior timber frame support. Last came the additional modern necessities — heat, restrooms, etc. (Click here to read about the barn’s extensive transformation.) 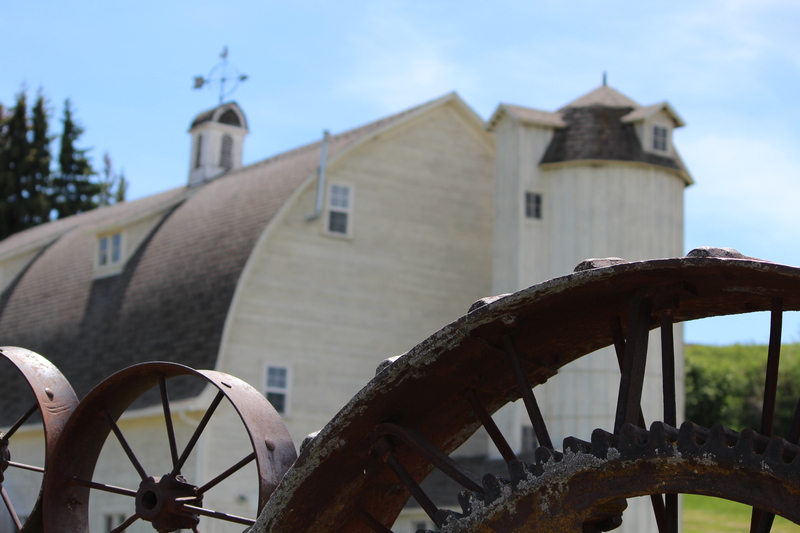 Today, the Dahmen Barn is a tribute to the donors and visionaries of Uniontown as well as to the artisans who fill it with both fine art and folk art of the area. 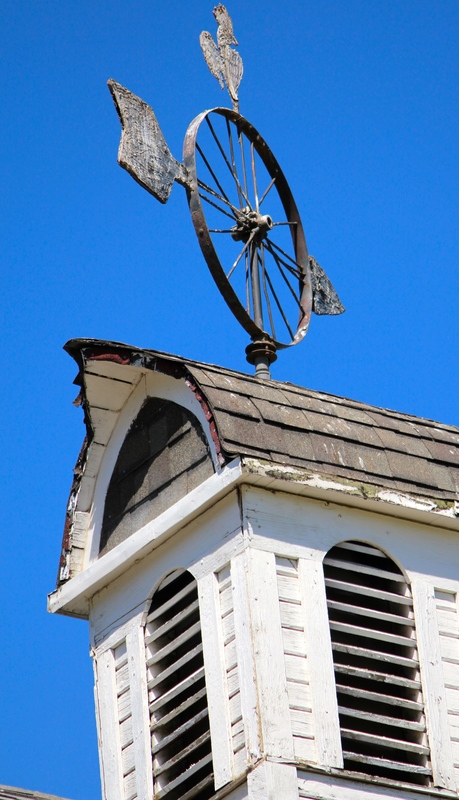 Weathervane designed by Steve Dahmen sits atop the barn. Other notables at the site include a red barn bearing a quilt pattern and a folk art cow made of gathered metal parts gazing at the passing cars. But it was the juxtaposition of the weathered, rusting wheels on that long, meandering fence that made us take cameras in hand and snap away. If you want to visit Artisans at the Dahmen Barn, be mindful of the hours. The barn is open Thursdays through Sunday only from 10 AM to 6 PM with early closure at 4 PM during January and February. No admission fee. Be sure to bring your camera. 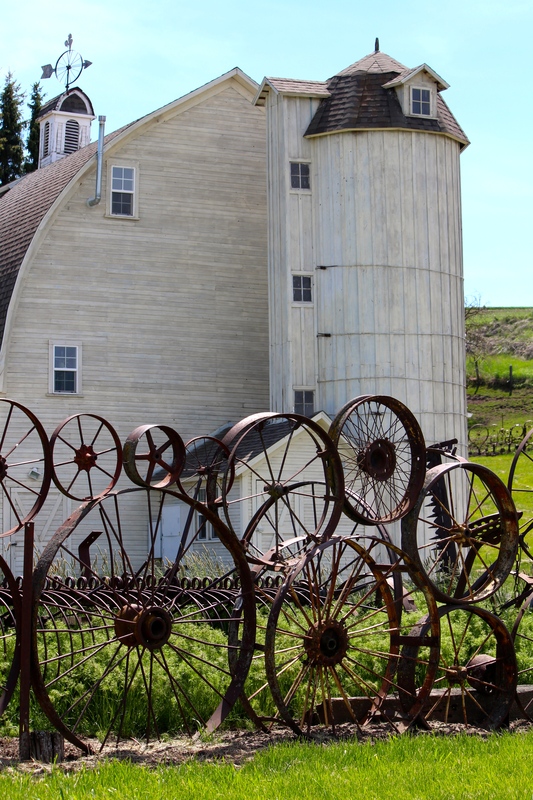 You don’t want to miss this piece of Americana on the Palouse! 419 N. Park Way P. O. Box 36 Uniontown, WA 99179 509-229-3414 www. ArtisanBarn.org Facebook: https://www.facebook.com/DahmenBarn?ref=br_tf My Pinterest board — Barns, Farms, and Country Things: http://www.pinterest.com/rushasams/barns-farms-and-country-things/ If you want to see more of our travels throughout the Inland Northwest, click on the page at the top of this blog: Inland Northwest. Thanks for traveling with us! This entry was posted in Destination, Photography, Travel, Washington and tagged Artisans at the Dahmen Barn, Dahmen Barn, folk art, Junette Dahmen, Palouse, Steve Dahmen, Uniontown, Washington, wheel fence. Bookmark the permalink. Well, thank you ever so much! That is a GREAT barn, but the wheel fence is quite special, too. Love folksy art! Fascinating. Great story and images. Love the shape of that barn. Thanks so much. It’s now one of my all-time favorite barns — and it’s white! Mostly I see red ones, so this one is special to me. Appreciate the comment. Thanks so much for reading/commenting. It was a unique place — out in the middle of nowhere, or so it seemed. But what a great building and fabulous fence. We love Americana like this, especially when it’s re-purposed for artists! Thanks so much for stopping by to take a look. The fence would be worth the stop, but seeing the interior of an old barn renovated and refitted for artwork was icing on the cake. great photos – interesting place! Thanks for your comment. It was very interesting. We went by it twice, not realizing that it was only open Thursday through Sunday. But well worth making two stops! You got some wonderful shots. Great eye! Thanks! I keep hoping one of the word challenges will be wheel so I can run some of these photos again. I guess I just have an affinity for rust! Thanks so much for taking a look at this wonderful old barn. It’s so good to see something like this being used and maintained.